Recently out is a great paper redescribing the skull of AMNH FARB 6810 (link is to free download), one of the best specimens of Plateosaurus. The authors are Albert Prieto-Márquez and Mark A. Norell (P-M&N, to save me some typing time). I have never met Albert in person, so I can only go by his reputation. He is a mostly-hadrosaur guy who has published quite a number of great papers. Currently, he is on a Humboldt Fellowship in Munich, and I very much hope to meet him soon. Mark Norell is famous, for good reason, and a very experienced and thorough researcher and curator. I had the pleasure of meeting him several times, at the AMNH and at one of the Sauropod Research Group meetings in Bonn. Mark is a fun guy, and I love the way he insists on figuring and describing specimens in excruciating detail. He is, in that respect, old-fashioned in a positive sense. AMNH 6810 Plateosaurus engelhardti von Meyer, 1837. Picture from wikipedia. See below on why I believe this is not P. erlenbergensis. The new paper is titled “Redescription of a Nearly Complete Skull of Plateosaurus (Dinosauria: Sauropodomorpha) from the Late Triassic of Trossingen (Germany)”, and that’s exactly what it does, and extremely well. I just finished adding bookmarks to the PDF (I always do that so I don’t have to scroll up and down like crazy to find the part that deals with, e.g., the maxilla), and it was quite an exercise. P-M&N go through the skull bone by bone, with commendable thoroughness. And the figures! (in fact, that deserves to be FIGURES!!!). Thirty four of them, all elements of the skull are shown in all imaginable views. Luckily, the extremely nice skull was taken apart during preparation. Usually, preparators and researchers alike shy away from this, to preserve the relationship between bone. In the case of Plateosaurus, however, so many skulls were known that the AMNH decided to get the bones apart. The skeleton of SMNS 13200, the best described Plateosaurus specimen so far (Huene 1926), was taken apart, but the skull was not. Other skulls were only partial, often quite damaged, or much deformed, or whatever – in any case, only once previously was a detailed paper published describing a beautifully preserved skull of Plateosaurus with the ability to check each bone separately. That publication was written by Peter M. Galton, in 1984. Peter wrote a series of papers, and in two of them covered the skull bones extensively, going on to determine the diet (herbivorous) and prise out as much information as possible about the soft tissues. Huene, when describing SMNS 13200 in 1926, figured the bones lavishly, as he usually did. But obviously he published drawings, not photographs. The workmanship is incredible, and these old engravings have a beauty and value of their own, but still: the data went through several brains before it reaches the reader, and errors of interpretation (draw a line or not, stiple or not, etc.) and proportion are more likely than in photographs. Not that photos do not have their own pitfalls….. Anyways, here’s Table 1 from Huene (1926). and they certainly do exactly that! So, chaos ensured, especially because Huene erected a lot of taxa he later binned. Peter Galton did a lot to clean this mess up, and added a few goofs of his own. Giving the wrong year of the first description of P. erlenbergensis was one of them, in Galton (1984) [Peter quickly realized his mistake (Galton 2001a)]. Peter dismissed the P. erlenbergensis holotype as a generically indeterminate (i.e., the material was not sufficiently distinct to be anything on its own) in Galton (2001). In fact, that happens in an addendum added when the paper was in press. Now, P-W&N disagree, and regard P. erlenbergensis as valid, and if they are correct in this, then they are also correct in that P. erlenbergensis Huene, 1905 has priority over P. longiceps Jaekel, 1913. That’s, finally, a no-brainer: 1913 > 1905, thus 1905 description valid, period! If it only was that simple! Taxonomy rule No. 1: RTFP! But which paper am I f-ing supposed to read? It may be simple in some cases: original descriptions, no further mentions, at least no dissenting ones. And it may be a bit more complicated in cases like Kentrosaurus. I’ll have to regurgitate that story one day on this blog. For now, suffice to say that a certain highly esteemed (no kidding!) researcher who says his German is “atrocious” did not fully understand the detailed descriptions that followed the first description, and thus missed out on a lectotype description. And went and selected a new (invalid) lectotype. Oops! I got a nice paper out of sinking this (sorry, no OA, email or yell in comments for PDF). But that is, admittedly, a far cry from the taxonomic chaos and muddle that is Plateosaurus. So what to read? Obviously, you should ideally work your way through all of Huene’s papers. That would include Huene 1932, where Huene (1932, p. 166) gives the first description of P. erlenbergensis as Huene 1908, p. 42-68. Aha! Still, the ICZN is always smarter than anyone who ever worked in the wide field of palaeontology. GRMPH!! Huene 1905 it is. Anyways, Huene. Then, obviously, Jaekel – after all, this is the guy who described all the Halberstadt material. If you read Huene you can’t help but realize that there was this guy who worked on the Halberstadt stuff and assigned it to a species, P. longiceps, which just happens to be the one Galton for a long time upheld as being separate from P. engelhardti (Galton 2001a, 2001b). In fact, Peter Galton still seems to think this is a valid species (pers. comm. @ SVP 2011). So Jaekel (1913-1914) it is. There are then a lot of Peter Galton’s papers to read, and to be honest Peter sometimes added to the chaos. Overall, I guess you have to wade through a few thousand pages of papers, and then you haven’t covered all the non-German material. Luckily someone has gone and done all that that for us! It’s all in the hip! And here we get to the nub of the problem, and the reason why I think AMNH FARB 6810 should not be called P. erlenbergensis, but rather P. engelhardti. 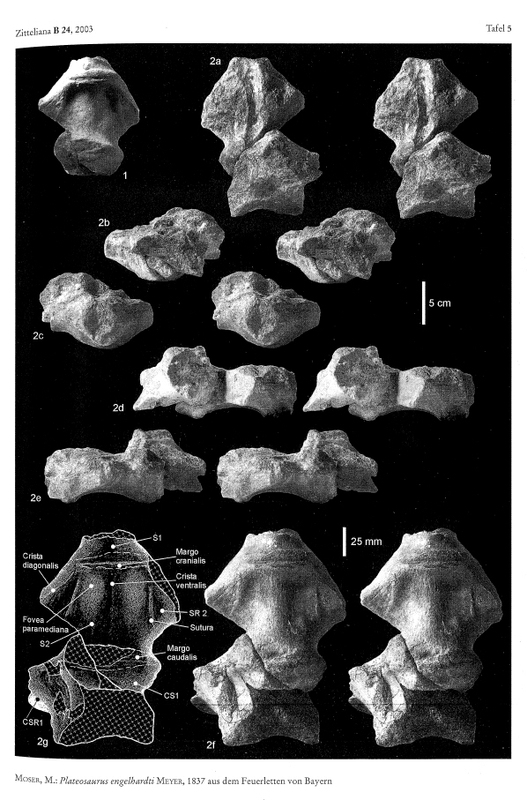 The type species was erected on the basis of a bunch of postcranial elements. The quality is, well, scrappy, and some of the bones have been broken or lost since discovery. Also, there was a bunch of non-prosauropod material in there, including turtle plastron pieces and theropod bones. Overall, it is mostly vertebral material, some dorsal, some caudal, and a sacrum. Add to that a femur + femur piece, a chevron, a tibia, etc. It is all described and figured in detail in Markus Moser’s 2003 paper. Moser puts the focus of his study on the hip, because the sacrum has many characters, and played a pivotal role in Galton’s papers that upheld P. longiceps (i.e., P. erlenbergensis). To sum a many-page discussion up: Galton (2000) flipped the photos of the sacrum 180°, so that what he assumed was posterior was in fact anterior. This turns a co-ossified dorsal, a dorsosacral, into a co-ossified caudal, a caudosacral. Moser described the sacrum in excruciating detail, and discussed the sacra of other dinosaurs with a supposed dorsosacral (there are plenty), and went on to show that it is easy to screw sacral assignment up. However, there are no true dorsosacrals with big attachments to the ilia in “prosauropods”, and those that exist are found in animals that have a real caudosacral, too. Thus, if the sacrum has only three verts, then you’re dealing with sacrals 1 and 2, plus a co-opted caudal. been “added to”, so the cast offers better info). And then Moser did something that was only logical: he checked if there were enough good characters on the sacrum to make it diagnostic (yep! ), he selected the sacrum as the lectotype of Plateosaurus engelhardti von Meyer, 1837, and checked if it is significantly different from the Trossingen and Halberstadt material to support the presence of a second species there. And the answer is NO! Uhm, is that a total IGNORE of Moser’s assessment, or am I a hedgehog? I don#t want to have to grow all spiky all over, so I’d say it is an IGNORE, because the rest of the Discussion deals only with the question if P. erlenbergensis is a nomen nudum or not (not, P-M&N conclude). OK, so maybe I missed something earlier on in the paper? What does the Systematic Paleontology section say? Nope, it doesn’t address anything regarding P. engelhardti at all. Sadly, Mark hasn’t answered (yet), thus I have no solid information on their motives. 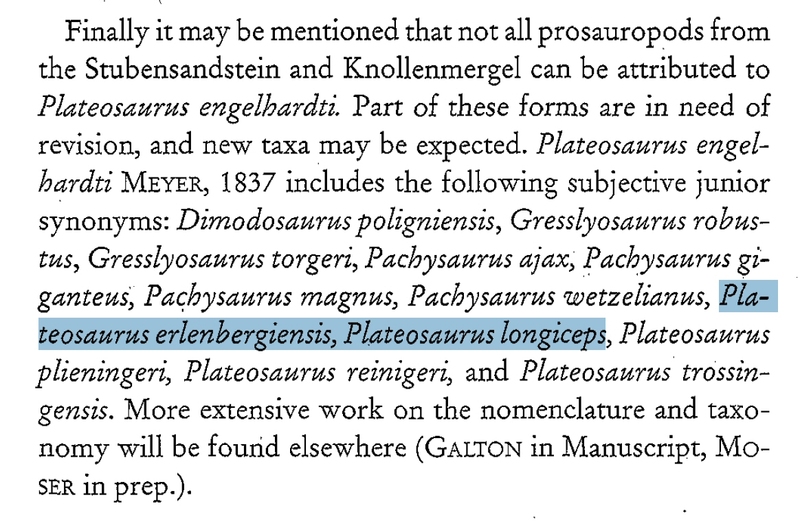 However, I have heard rumors that there will be an ICZN petition to make AMNH FARB 6180 the neotype of Plateosaurus, claiming that the P. engelhardti material is non-diagnostic, and citing in detail a paper that says the opposite would not be very productive in this context. I have no idea if either of the two authors is in any way involved in this scheme (a stupid one, if I may say so), but their studious ignoring Moser (2003) makes me wonder, as does the timing of the redescription. 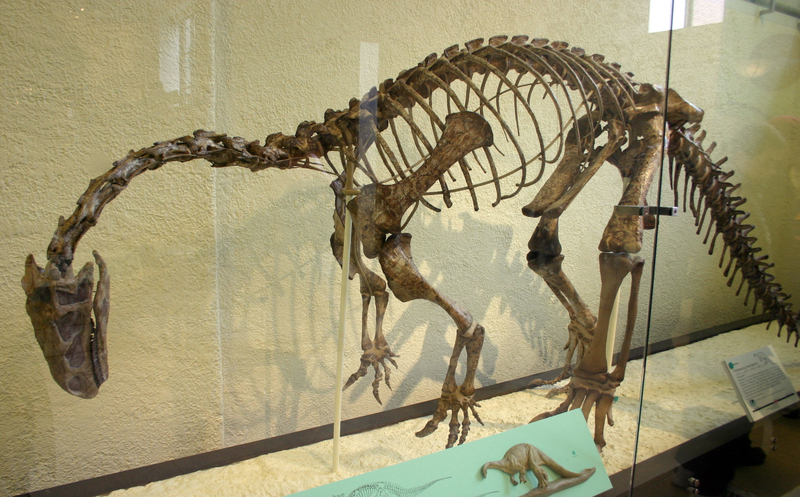 Oh, and here is my candidate (if it must be done) for a neotype of Plateosaurus: GPIT/RE/7288 from Trossingen. The skull is not as nice as that of AMNH FARB 6810 (the mounted one is a cast; the real skull is somewhat squished and still in semi-articulation), but the skeleton is NOT partly encased in plaster (AMNH FARB 6810 has carpals and tarsals in plaster), it is accessible (AMNH FARB 6810 is in a glass cage, and the AMNH is very reluctant, for good reason, to remove any of the glass), and there even are high resolution CT scans of the entire postcranial material of GPIT/RE/7288 available. Can’t get much better than that, especially because you still can use AMNH FARB 6810: there are so many characters linking the two that you can waste a full page listing them. Galton, P.M. 1984. Cranial anatomy of the prosauropod dinosaur Plateosaurus from the Knollenmergel (Middle Keuper, Upper Triassic) of Germany. I. 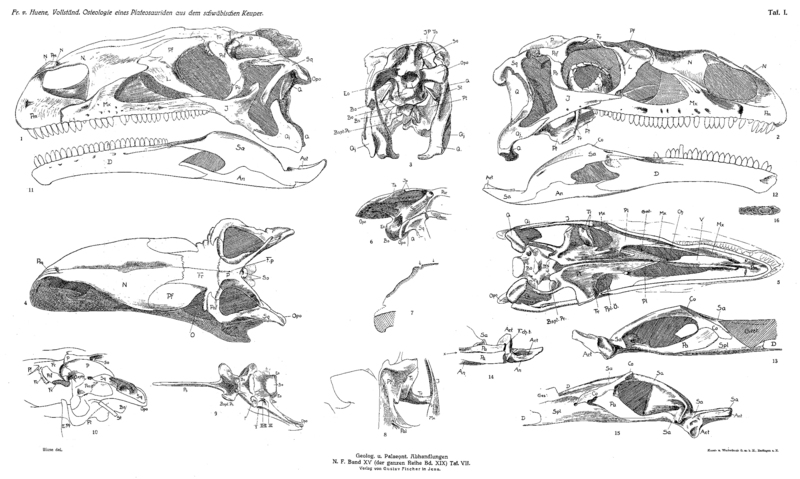 Two complete skulls from Trossingen/Württ. With comments on the diet. Geologica et Palaeontologica 18:139-171. Galton, P.M. 1985. Cranial anatomy of the prosauropod dinosaur Plateosaurus from the Knollenmergel (Middle Keuper, Upper Triassic) of Germany. II. All the cranial material and details of soft-part anatomy. Geologica et Palaeontologica 19:119-159. Galton, P. M. 2001a. Prosauropod dinosaurs from the Upper Triassic of Germany. In Colectivo Arqueologico-Paleontologico de Salas, C.A.S. (Eds. ): Actas de las I Jornadas Internacionales sobre Paleontologia de Dinosaurios y su Entorno (Proceedings of the 1st International Symposium on Paleontology of Dinosaurs and their Environment), Burgos (Spain), 25-92. Galton, P.M. 2001b. The prosauropod dinosaur Plateosaurus Meyer, 1837 (Saurischia: Sauropodomorpha; Upper Triassic). II. Notes on the referred species. Revue Paléobiologie 20(2):435-502. Huene, F. v. 1926. Vollständige Osteologie eines Plateosauriden aus dem schwäbischen Keuper. Geologische und Palaeontologische Abhandlungen, Neue Folge 15(2), 139-179. Huene, F. von, 1932. Die fossile Reptil-Ordnung Saurischia, ihre Entwicklung und Geschichte. Monographien zur Geologie und Paläontologie I(4): 1-361. This entry was posted in "Prosauropoda", AMNH, Dinosauria, Plateosaurus, Sauropodomorpha. Bookmark the permalink. GPIT/RS/7288 is certainly a fine selection for a neotype, but what about SMNS 13200? The entire skeleton is accessible, and the skull is nearly complete. …and the entire animals is pretty squished. GPIT/RE/7288 is in far better shape. But yes, people tend to think of SMNS 13200, because of Huene 1926, as the de-facto holotype. See, e.g., Yates 2003, who explicitly uses it in that role.